Today is one of my oldest friend’s birthday. Happy Birthday Stacy!! 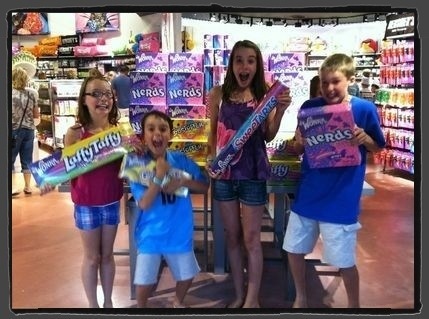 Speaking of a sugar craze, the kids thought they hit the jackpot in Myrtle Beach this summer. This pic was taken at IT’SUGAR at Broadway at the Beach. In honor of both her birthday and the fast-approaching first day of school, I wanted to share a birthday idea I got from a friend at work. On the first day of school during Advisory/Homeroom, I have students decorate a name tag/tent. They write their name on one side and on the back they write their birthday and favorite candy. I use these name tags for the first few days in order to learn their names. Later they can be used to make seating charts or used to create cooperative learning groups. I collect the name tents at the end of the period and record all their birthdays and favorite candy bars on the calendar. Then every two months, Tweedle Dee and I go on a candy-seeking mission after school while we wait for her brother to get home from elementary school. Sometimes it is tricky and we have to search high and low for a certain candy bar but I have never missed anyone’s special day. Caramello, Cow Tales, Sweet Tarts, and Peanut Butter M & Ms are some of the hardest to find. I have the best luck at the gas station or at convenience stores like Circle K.
On each student’s birthday I make a grand presentation during Advisory. And I let them eat it if they want (9 out of 10 kids do so and 4 out of 5 teachers “thank” me for the sugar rush). But it’s their special day…and a little sugar never hurt anyone, right Stacy? I never thought about sugar being banned. We aren’t allowed to sell candy in our classes anymore -which we did to raise money for Relay For Life. Maybe you could do mini bags of chips – Doritos or Cheetos??? They sell them for 3/$1 at The Dollar General. That’s Ian on the left – he is a character for sure!! Haha! What a healthy school! You could make them a little birthday card with a note – That is something I would keep forever. PS. I can tell Ian is a character. My favorite kind of kid!